The graphs are attached from the entire Iron County Board of REALTORS Multiple List Service (MLS) for 2013. Nearly 1000 homes sold under $200,000, but only 290 homes sold above $200,000 all the way up as high as prices go. 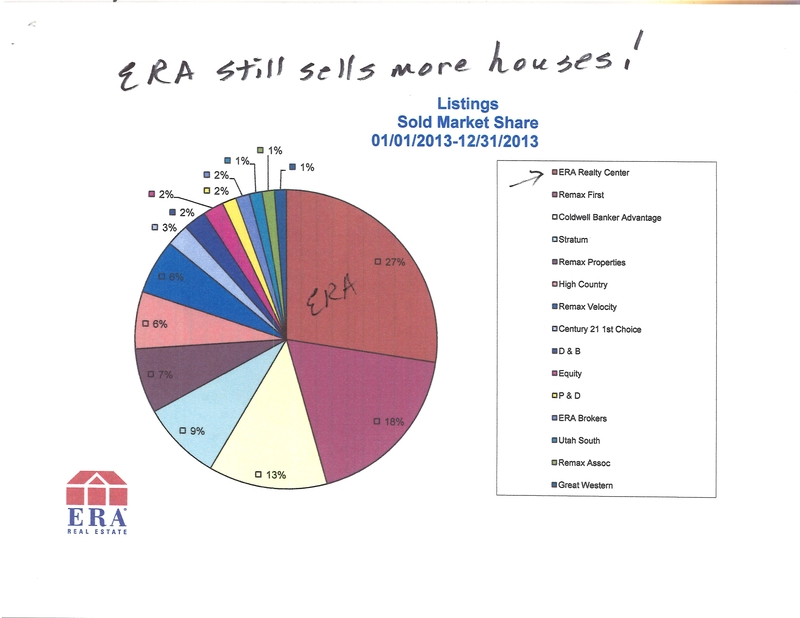 ERA Realty Center agents sold more than any other office, which has been the case for many years. Lots are selling but for bargain prices. Buyers are looking to pay as little as possible for lots in order to be able to build their homes for an amount that will appraise to get their loan. We are seeing new construction in our area and speculation homes being built by contractors. That is a good sign for a recovering market. There are many more lots for sale than buyers to buy. Acreage, commercial and development land are still slow sellers. The latest Utah Association of REALTORS (UAR) Local Market Updates by County are attached. 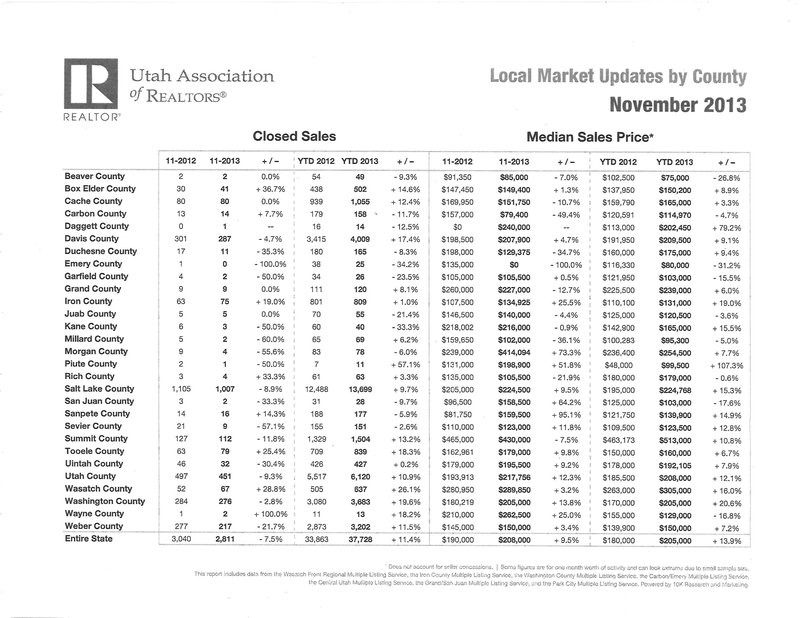 As you know it takes UAR about 2 months to compile this information for all the counties in Utah, and November 2013 shows Iron county closed sales are up, and the median sales price is also up to $131,000. Our area market is steady. We do still have foreclosures and short sales. We are seeing multiple offers on homes that buyers perceive to be a bargain in most price ranges. We do see more multiple offers on homes in the lower price ranges under $200,000, however. We do not have enough home inventory in the lower price ranges to satisfy the demand. Homes are selling in all ranges when market-priced, staged, and marketed aggressively as our Team does. Quoting “UTAH REALTOR OFFICIAL MAGAZINE OF THE UTAH ASSOCIATION OF REALTORS * FIRST QUARTER 2014” Page 9, “We’ve seen hard data from the past 18 months that shows rising home prices and a foreclosure market with diminished impact due to decreasing foreclosure inventories and fewer new foreclosure filings,” said FNC Director of Research Yanling Mayer in a blog post regarding the Company’s Market Report. According to the above UAR Magazine, “Move-up buyers are back.” They seem to be making a stronger come-back in Northern Utah than here, but we are seeing buyers moving up in our market also. We are seeing investors back in the market here as well as buyers who are tired of renting and who now can qualify for a home. They are finding they can sometimes get a loan only one year after their foreclosure or short sale. The UAR Magazine provides a “2014 Utah Real Estate Forecast” by Deanna Devey, UAR Director of communications and operations, on Page 20, “Economists: Sales to remain steady next year while prices rise at a lower rate.” “Sales will be at least as high as 2013 barring any unforeseen international events or financial crises,” said Jim Wood director of the U of U’s Bureau of Economic Development and Buiness Research. According to “The Residential Specialist” Magazine, “In a recovering market, strategic pricing is more important than ever.” Please call your Naisbitt-Bagley Team today to help you price your home or real estate in order to attract top dollar quickly and with the least amount of problems. Isn’t that what you want? Your Naisbitt-Bagley Team will give you the past and present real estate market information that will allow them to ask you, “Where do you think your home fits in the market. ?” You will be able to see for yourself what the best price range for your property would be using the sold data and listing competition available on the MLS. offer from the buyer. Please call your Naisbitt-Bagley Team today, and they will be happy to let their expertise and training benefit you. According to national trainer, Barb Schwarz, “The way you live in a home and the way you sell a home are 2 different things.” Please remember that you want to make your home ready to be in a picture magazine because it will be. Pictures and videos of your home will be online worldwide. Top marketing is also imperative in today’s world of real estate. As far as I am aware, your Naisbitt-Bagley Team is more aggressive in their marketing with advertising wherever your buyer might look including, featured ads on line, magazine ads, newspaper ads, TV, radio and more. They even pay the Chamber of Commerce to send your ad to people who contact the Chamber. Top of Mind Awareness training classes indicate over 90% of buyers purchase as a result of on line ads, so you will see their ads on aol, msn, google, yahoo, homes.com, realtor.com, and many more sites including ERA, Coldwell and Century 21. Your real estate goes all over the nation and worldwide. I don’t know how you can beat it! Please call your Naisbitt-Bagley Team at 435-865-1019 ERA Realty Center for your free real estate consultation on how to best reach your real estate goals. Please call to discuss questions and concerns also. You can email naisbitt@inxsnet.com or text Janet’s mobile 435-559-7772, Matt’s mobile at 435-590-8788 or Jennifer Corral’s mobile at 435-559-0366. Check out www.findhomesincedarcityut.com or www.homesincedarcity.com.